I consider myself a patient person–usually. But some days things happen that test my sanity level, which isn’t high to begin with. My cholesterol level is the lowest it’s been in years!! However, my blood sugar level is up. I’m convinced it’s all the sappy romantic-comedies my hubbie makes me sit through. Those movies have given me pre-diabetes–and probably tooth decay. Driving along when a flock of geese decided to cross the road. (There’s a joke there somewhere.) 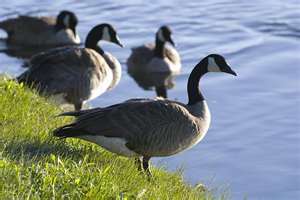 My fellow drivers and I stopped to let the geese pass–except for one a**hole driver who raced down the emergency lane–almost taking out two geese. People who are irritatingly smug. That stupid ad folded over my newspaper. It is a half-page of aggravation. My computer that I have nicknamed “Zen” because it likes to sit in silence and do nothing. Counting calories, eating healthy, working out–and not losing ONE OUNCE. Shopping carts with one wonky wheel. The fact that someone thought “The Smurfs” would be a great movie. Whaaaa???? That’s it for today. At least so far.